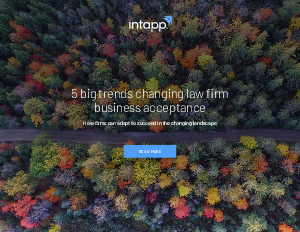 Offers > Intapp > Free ebook: "5 Big Trends Changing Law Firm Business Acceptance"
The business of law is changing, and literally no corner of a large law firm operates exactly like it did several years ago. The process for evaluating and onboarding new clients in law firms is no exception. This ebook outlines why and how these big trends are causing shifts in law firm approaches, provides insights and practical tips on what firms must do to adapt their business acceptance models, and identifies specific areas where technology can help. Plus – get a checklist to assess the gaps in your firm’s acceptance approach in this changing landscape.